If you have ever had the pleasure of getting to witness an elephant in the wild then you know how beautiful and elegant these creatures are. Despite their enormous size and stature, these animals move with the utmost grace as if they have complete control over every muscle and step. Knowing this about adult elephants … we’re sometimes left to wonder how on Earth baby elephants can be so … well … clumsy! These little ones are barreling balls of energy who seemingly have zero control over ANY muscle in their body (seriously, just watch this guy trying to figure out his trunk!). Just like a human toddler learning to walk, elephants have a propensity for tripping, falling, throwing temper tantrums, and all the other messy parts of growing up. But through it all these babies certainly know how to do one thing, enjoy every single second of life! 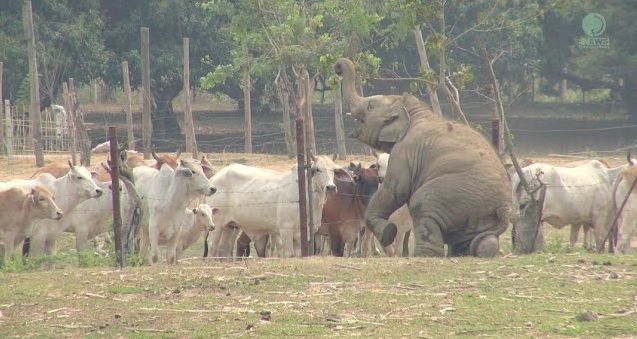 Responses to "Rescued Baby Elephant Meets a Herd of Cows and Challenges Them to a Dance Off "